Joseph Bellows Gallery is pleased to announce the October/November exhibitions featuring images of the military. The gallery will feature William Laven's series War Models and Edward Sturr's Infantry Series from October 13th - November 11th, 2006. 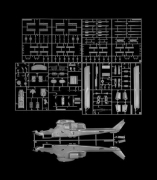 William Laven's "War Models" presents a highly unusual survey of the military aircraft currently in use in the Iraqi theater of war. 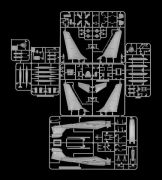 He points his camera not at the actual machines in flight or on the ground, but at the raw plastic parts from model airplane kits purchased at a hobby shop near his home in the San Francisco Bay area. 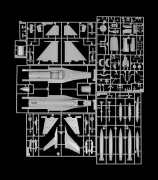 In the images, aircraft elements such as wings, fuselage, tail assemblies, and other details appear randomly arrayed throughout a grid of piping comprised entirely of light-toned gray plastic. Photographed by the artist against a stark black background, the images at first seem almost entirely abstract. Yet, within the viewer's eye, these disparate parts readily assemble themselves into the potent, enormously lethal, and often enormously large objects that these "toys" authentically represent. Laven quickens this experience by scaling the images to each other in precisely the same proportions as their real world counterparts. 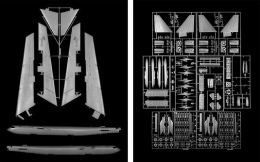 As a result, the printed image of model parts for a GR4 Tornado strike aircraft measures a modest but still substantial 18 by 27 inches, while the print of B-1 Bomber elements measures a surprising large four by six feet. The artist's use of carbon pigment inks on archival paper gives these digitally produced images a visual richness and textural character that perfectly serves his goal of creating a body of images that are in no way imaginary, but which spur the mind and the imagination. Laven received his MFA degree in 1991 from the San Francisco Art Institute. His interest in military aircraft reflects something of a family heritage. His uncle, Col. George Laven Jr., was the most decorated Jewish-American pilot of World War II. Opening reception with the artist, October 13th, 6-8 pm.